Prime Minister Sheikh Hasina reaffirmed her government's commitment to ensure equal rights of people belonging to all religions and races. "I believe that people of all religions will live in harmony with equal rights and perform their rituals independently," she said when leaders of Bangladesh Puja Udjapan Parishad paid a courtesy call on her at her office yesterday. Sheikh Hasina said not only in words, the Awami League always believes in non-communalism in deed. 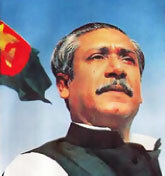 "We are pledge-bound to build a non-communal Bangladesh with the spirit of the War of Liberation," she added. 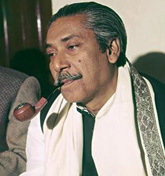 The Prime Minister said the people liberated the country in 1971 after a long struggle under the leadership of Father of the Nation Bangabandhu Sheikh Mujibur Rahman with an aim to build a non-communal Bangladesh. She said Prophet Hazrat Muhammad (PBUH) always spoke of performing religious rituals of all religions independently. 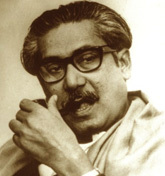 The Prime Minister said the greatest Bengali of all times Bangabandhu Sheikh Mujibur Rahman tried to stop communal riots in 1964 by taking the risk of life aimed at building a non-communal Bangladesh. 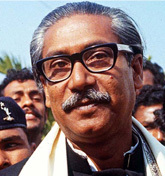 Referring to repression on minorities after the 2001 elections, she said the BNP-Jamaat perpetrated atrocities on minority people for casting their votes for Awami League. Sheikh Hasina said the 1/11 was created in the country due to unbridled corruption, terrorism and plundering of public money by the BNP-led four-party alliance government. Besides, they tried to come to power again by using 1.23 crore fake voters. But, their conspiracy went in vain, as all fake voters were discarded from the voter list and for this, they had to face debacle in the last general elections, she added. 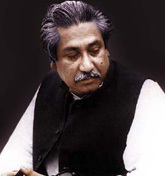 In this connection, she said her government is committed to fulfilling the desire of the people for which they voted Awami League to power. "We want to give the people a prosperous life," she said. About the demand for enforcement of the Vested Property Act- 2001 with some amendments and formation of Hindu Foundation, the Prime Minister said this would be done in consultation with all concerned. She also asked the Bangladesh Puja Udjapan Parishad leaders to provide a list of mandirs (temples) across the country and the condition of the property of the temples. In this connection, she said that the government has already approved a project in the ECNEC for the development of the historic Kantajir Mandir in Dinajpur. She said the government is considering a proposal for the Hindu community to register land given as gift as per the provision of `heba' practised by the Muslims. Among others, Chief Patron of Bangladesh Puja Udjapan Parishad Maj Gen (retd) CR Dutta, Bir Uttam, President of Puja Udjapan Parishad Swapan Kumar Saha and General Secretary Satyendra Chandra Bhakta, President of Mahanagar Puja Committee Kajal Devnath also spoke on the occasion. Adviser to the Prime Minister HT Imam, Puja Udjapan Parishad leaders Paritosh Mandal, Dr LM Nath, Ashim Kumar Ukil, Pankaj Devnath, Sujit Kumar Nandi, journalist Bashudev Dhar, Sukumar Ghosh MP, Apu Ukil MP, Shyamol Benarjee, C R Majumder and Jayanto Sen Dipu were present.